The history of these little known vehicles can be traced back to 1914, when the private funds of a certain Mr. Merkulyev were used to build three cars based on several chassis – two “Benz” cars and a “Pierce Arrow”. They were intended for an armored car intelligence team. 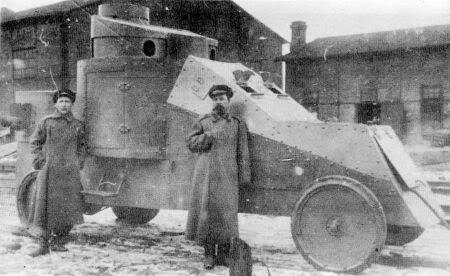 They were covered with an improvised type of armor, and formed into the second armored unit (company Dobrzhansky), later transferred to the 8th Army. 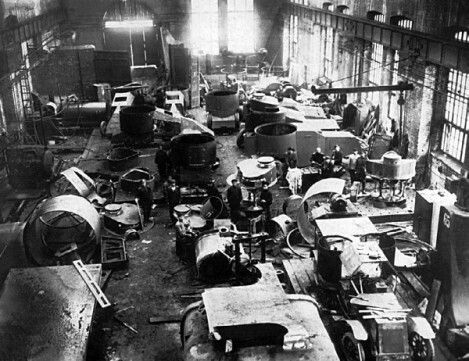 The committee formed for their reception judged the armor unsatisfactory and sent them to the Izhora Works in St Petersburg, headed by staff officer V. Mgebrov. He devised completely new armored bodies, offering full protection. More chassis were also provided, and they received revolving turrets with the same machine-guns, with the exception of the White, which was also equipped with a Hotchkiss 37 mm (1.46 in) QF naval gun. Mister Merkulyev has also financed part of the work done for the conversion of these vehicles. Of the two Benz vehicles donated by Merkulyev, the smaller of them, a race car with a 150 hp engine, was deemed unfit for armoring. 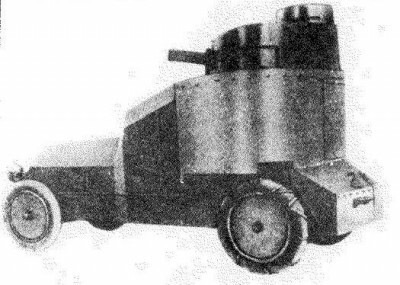 The other one, with a 100 hp engine, was among the first vehicles to be converted by Mgebrov’s team. 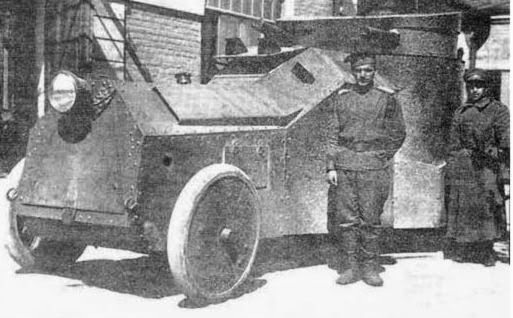 The vehicle entered service, along with the White and Pierce-Arrow, with the 29th platoon, and was sent to the Caucasus Army on 21 November 1915. 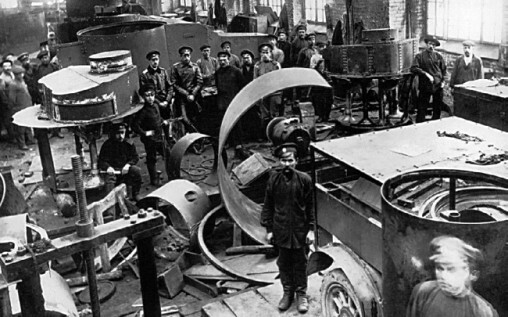 They returned to Petrograd in June of the next year for repairs. However, the Mgebrov-Benz was deemed as too cramped, and it was decided to convert it for railway use. It arrived in Savelovo, an important railway depot north of Moscow, in February 1917. Its engine was removed to be used on a trolley. 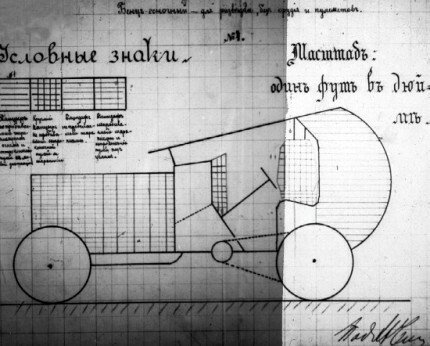 No further information is available about the fate of the vehicle, and the only remaining visual reference is a drawing of the conversion made by Merkulyev. 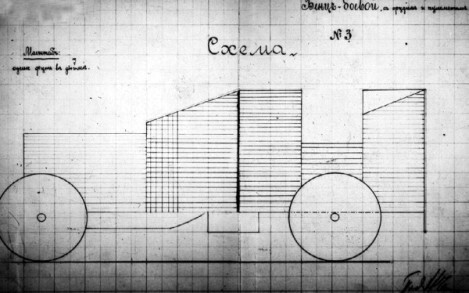 Blueprint of the 100 hp Benz car after it was armored by Merkulyev. 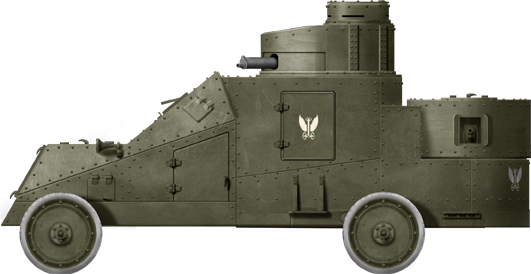 This vehicle was then taken over by Mgebrov and was rearmored at the Izhora plant. This is the only visual reference available of this chassis. The original vehicle was produced in September 1915 by Pierce-Arrow Motor Car Co. in Buffalo, New York, and the purchase was funded by private donation. The vehicle was apparently also a racecar initially and had a Pierce-Arrow, gasoline 13,514 CC, 120 hp engine. 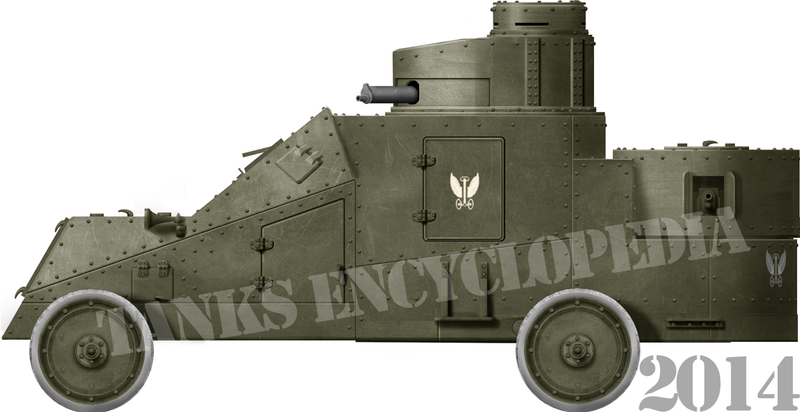 It had a crew of 5, the chassis was a 4×2 configuration, and after conversion at the Mgebrov factory it was covered with sloped plates 4 to 7 mm (0.16-0.27 in) thick, riveted. 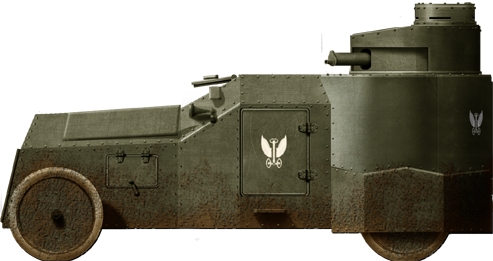 The armament was comprised of two 7.62 mm (0.3 in) Maxim M1910 machine-guns in half-turrets, in a similar configuration to the Mgebrov-Benz and White. As usual, there was a small conning tower behind, meant to direct fire with more precision. 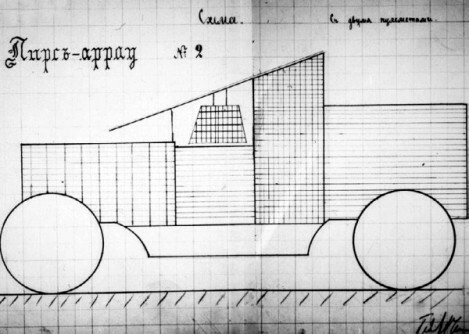 The vehicle served with the Caucasus Army from November 1915 to June 1916, after which it returned to Petrograd for repairs. 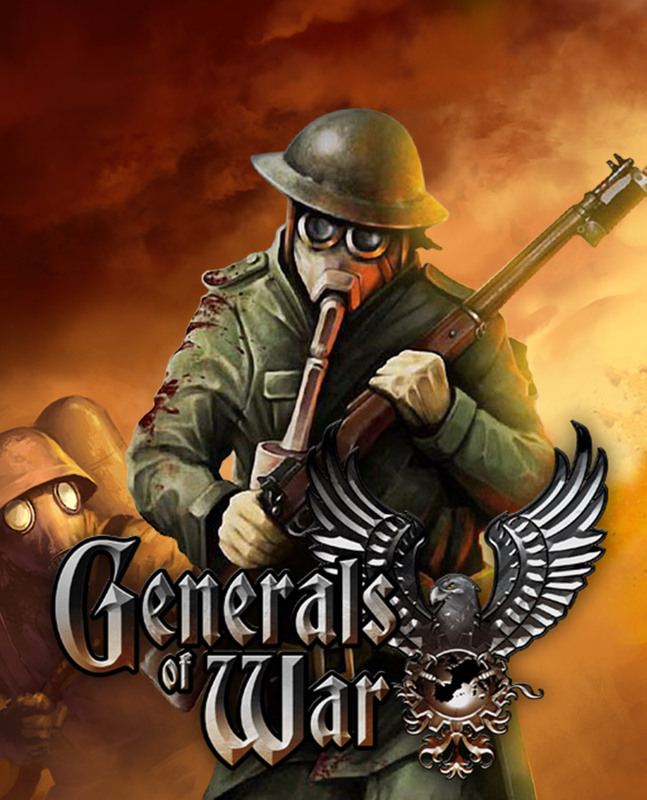 It was deployed on the South-Eastern Front in the spring of 1917 and participated in some battles. Afterwards, its fate is unknown. After the 150 hp Benz race car was rejected, Merkulyev donated an American 1,5 ton truck “White TBC” (“Standart B truck”). It was also converted by the staff-captain of the Military Automobile School (in Petrograd), Vladimir Mgebrov. 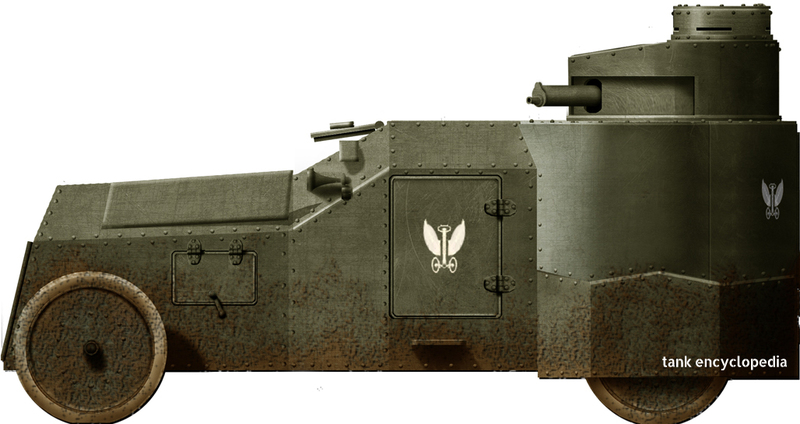 While it featured most of the features of the other Mgebrov designs, the White had another limited-traverse turret mounted at the rear of the vehicle, in a lower position, which was equipped with a Hotchkiss 37 mm (1.46 in) QF naval gun. 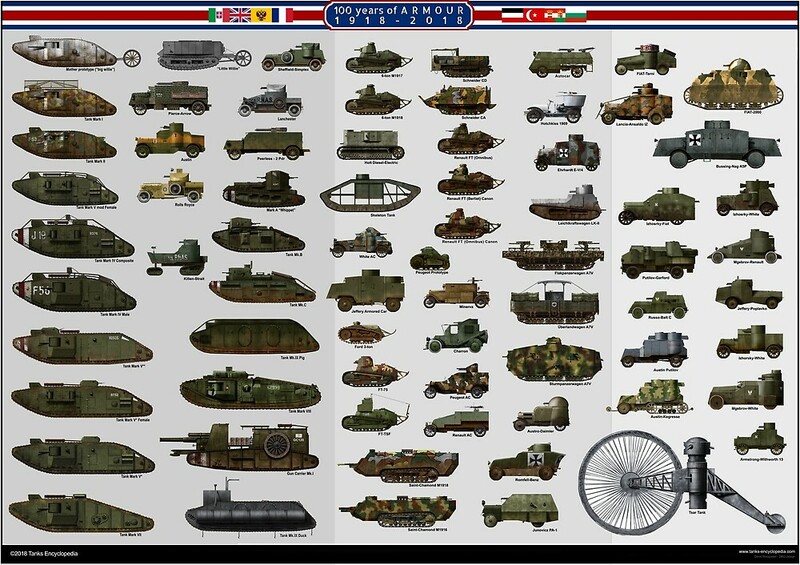 It served alongside the Mgebrov-Pierce-Arrow both in the Caucasus and on the South-Eastern Front. The Isotta-Fraschini chassis had a more interesting history. 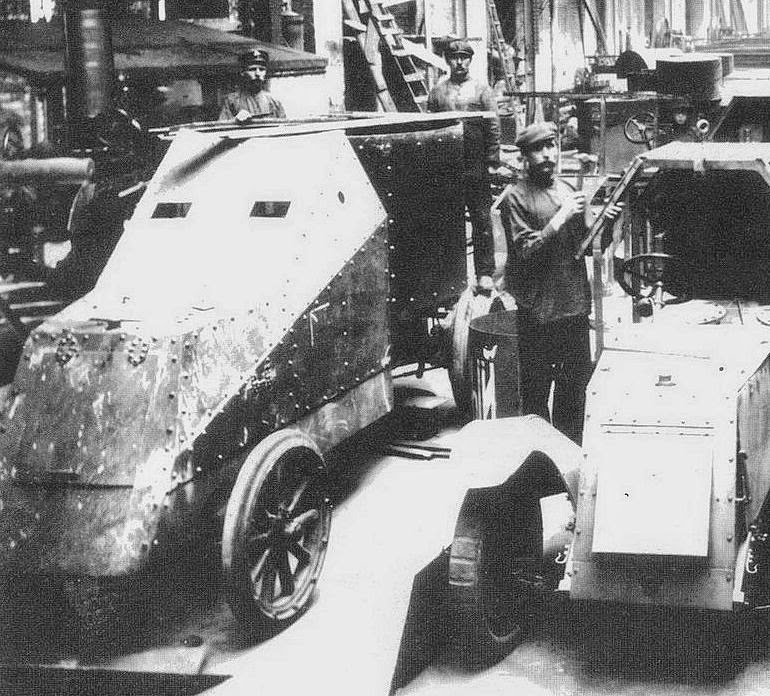 Two armored cars were ordered by the Italian Army in 1912 from the Milanese car plant, intended for service in the colonies. They were built on top of a 4-ton truck chassis with a new, more powerful engine. One of them was sent to North Africa, but the other ended up in Great Britain, after an attempt to sell it to the British Department of Naval Aviation. There, it was bought by a Russian commission and arrived in Russia in December 1914. However, it’s design was deemed unsuitable and it was rebuilt. The chassis received 7 mm (0.27 in) thick armor plates and two 7.62 (0.3 in) Maxim 1910 machine-guns in half-turrets, each covering a 45° angle.. It could apparently reach 65 km/h (40 mph) with an overall weight of 6 tons and a crew of 5. 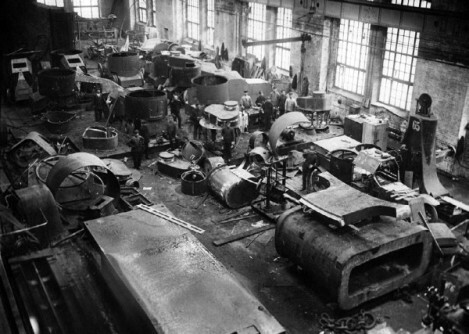 Due to the height of the radiator, the hull largely looked bulkier than other Mgebrov creations. It was 5620 mm long, 2800 mm wide, 2820 mm high. It was tested successfully in the autumn of 1916 in the shooting polygon of the Officer School, then sent into service and named “Skull”. During the Revolution, it was affected to the state 5 Red section OA in Saratov, March 2, 1919. 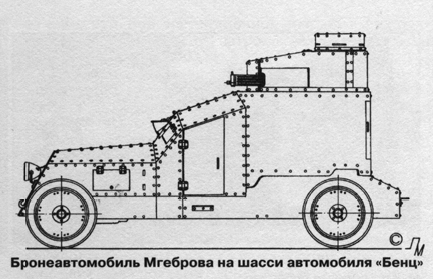 The Mgebrov armored cars share some characteristics which make them easy to distinguish from other designs. Most important of these is the angular nature of the armor, meant to better deflect bullets and shrapnel. Also characteristic is the large turret with two machine-guns and a commander cupola, which was however dropped on later Mgebrov-Renaults. While it might seem that it is fixed, the whole thing could rotate 360 degrees. 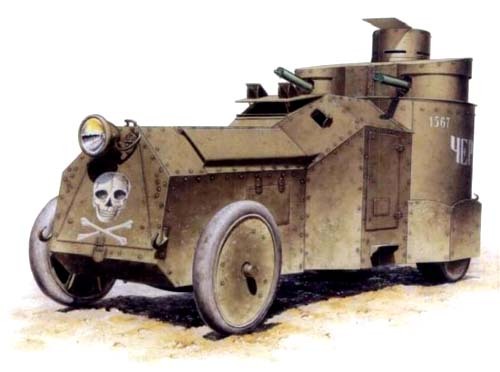 The fighting compartments were all cylindrical, wider than the turrets and the rest of the vehicle. Mgebrov-White in Russian service, 1915. The sole Mgebrov-Isotta-Fraschini in Russian service, 1915.